It’s a fact of life: You can’t run multiple apps at the same time on an iPad—not until the iPhone 4.0 OS update arrives, at any rate. Until then, there are workarounds that can give you a similar experience. One such workaround is Desktop for iPad by Aqua Eagle. The $1 iPad app features 10 built-in applications; you can run two of them at a time under a unified interface. Mind you, this doesn’t constitute true multitasking—you’re still technically running one app. But if you’ve ever found yourself longing to run a Web browser while writing an e-mail on your iPad, this app could be for you. 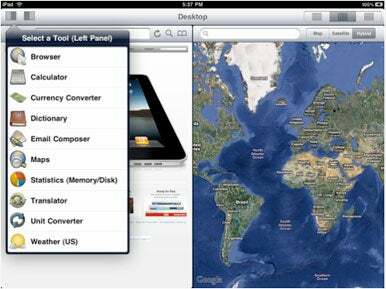 Desktop for iPad includes a browser, dictionary, maps, unit converter, language translator, calculator, currency converter, e-mail composer, weather, and device stats—all of which can run two at a time via a split-screen interface. You can view your running apps side-by-side, top-down, or full screen. While no substitute for true multitasking, Desktop could come in handy for people dying to do more than one thing at once on their iPads.